Editor’s Note: This is the first of two articles discussing DR technology updates. Look for the second article in our August issue. For the past couple years, DR manufacturers have been engaged in a game of catch-up. While significant advances have been made in modalities such as CT and MR, DR seems to have lagged. “I don’t want to say that DR has been neglected, but after the initial transition from analog to digital, standard X-ray seemed to have gotten left behind, and the major players were producing X-ray machines that were just good enough,” says David Webster, vice president of global sales and marketing for NeuroLogica (a subsidiary of Samsung). Samsung perceived the absence of substantial technologic advancements in digital X-ray. However, the situation provided manufacturers with the opportunity to take an existing modality and imbue it with innovative ideas. • Increasingly automated DR systems: Between exams, users can push a button and wait as the system reconfigures itself, allowing the users to better interact with patients and ultimately helping to streamline and enhance their experiences. In turn, users don’t need to manually reconfigure the system for each patient. • Dose reduction: Detector enhancements have led to improved dose efficiency. • Improved image quality: DR can improve image quality with detector enhancements and software innovation. Philips Healthcare reports three major trends in DR: accelerated digitization, intense cost optimization, and mobility. “While most of the mature countries are in a fairly advanced stage of digitization in their hospital environments, we see that the growth markets still use analog X-ray equipment and are just starting to transition to digital,” says Frans Venker, Philips’ senior director of global marketing for DXR. “Moreover, there is an increased need for more cost-efficient and affordable DR solutions targeted at smaller clinics in growth markets. The requirements for DR systems in growth markets are more challenging due to higher patient volumes and reliability needs. Also, increasingly, our customers face severe cost pressures and at the same time need to be able to serve a higher number of patients. Both room utilization and controlling DR costs are becoming more important as well, with the latter including both equipment costs and overall maintenance costs, Venker says. To meet these needs, radiology solutions have become more versatile. For example, Philips’ DigitalDiagnost is designed to provide a fully customizable and scalable solution both from configuration and maintenance perspectives, according to Venker. DR also is a maturing technology, according to Siemens radiography product manager Viola Fernandes. “[DR] will get even more mature, with vendors looking for ways to make DR technology even better, which will increase revenue for the customer,” she says. Samsung’s latest entries in the DR space include the GC80 and GU60 systems. The company recently announced the first US installations of these systems at McLeod Health in Florence, South Carolina. 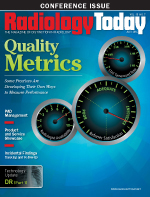 The technology allows McLeod’s 140-member radiology department to simplify workflow, quickly obtain quality images, and reduce patients’ radiation exposure compared with its previous X-ray equipment. The Samsung GC80 is designed to be a high-end DR system, and its features include smart throughput, smart dose management, and smart image quality that provide intuitive automation, improved image quality, and patient safety and comfort solutions, according to the company. The compactly designed Samsung GU60 contains a U-arm that can be rotated from 120 to -30 degrees or raised and lowered to suit the application. The auto-positioning function allows users to program the most frequently used exam positions for rapid exam setup, and its human robotics are designed to address current and future imaging needs. Other features include the Adaptive Local Contrast Stretching software architecture and dual-speed movement. Samsung plans to introduce a new wireless detector to the US market that will make radiography more dose efficient and further improve image quality compared with earlier models, Webster adds. Like other DR vendors, Siemens pursues dose reduction and greater efficiency, and these efforts are manifested in the company’s latest offerings: the Multix Fusion, Ysio Max, and Multix Select DR. “In the past two years, we have introduced Multix Fusion, our new wireless, single-detector solution designed for the smaller customer. It can be a radiography workhorse,” Fernandes says. The Multix Fusion is designed to meet customer needs for ease of use, improved image quality, dose reduction, efficiency, speed, and versatility. Users benefit from low running costs throughout the product’s entire life cycle, resulting from smart room utilization, low downtimes, and reduced training costs, according to the company. In addition, the many options for system upgrades provide investment security through a long product life. The Multix Fusion, with its small footprint and easy installation, is designed to be switchable for nearly all existing X-ray rooms. Components such as the tube, bucky wall stand, imaging software, and detector are designed to enhance productivity, patient friendliness, and dose reduction. Users easily can maneuver the system, and technologists easily can position patients and even take the flat detector to the patient. A set of advanced postprocessing tools offers the capability to adjust images after acquiring them to improve quality. The easy-to-position tube provides smooth operation and provides 71-inch vertical movement. Further advantages are the resilient ceiling stand and tube automation, allowing the system to follow the detector in the table or bucky wall stand. The color touch display sets key image parameters such as kilovolts and milliamperes right at the tube. The system’s features are intended to support users much like a personal intelligent assistant, according to the company. For example, the MAXalign feature displays the current detector angle on the system’s MAXtouch display screen, which reduces repeat exposures. The MAXtouch feature provides all necessary information regarding the exam on a large, intuitive color touch screen, allowing users to quickly change all key image parameters directly on the tube. MAXtouch also generates status messages, providing guidance for technologists and helping to increase safety by reducing the amount of time a patient spends alone in the treatment room, according to the company. Siemens also is offering three new flat-panel detectors. The MAX wi-D detector is Siemens’ lightest 14- X 17-inch wireless detector with a handle, weighing 6.6 lbs and measuring 0.7 inches thick. The MAX Mini, a 10- X 12-inch wireless detector weighing just 3.5 lbs and measuring 0.6 inches thick, is designed for orthopedics, pediatrics, and trauma exams. Siemens also offers the 17- X 17-inch MAX static detector. The Maxswap feature enables the use of the MAX wi-D and MAX mini detectors with multiple other Siemens radiography, fluoroscopy, and urology systems, including the Luminos dRF Max, Luminos Agile Max, and UROSKOP Omnia Max systems, to maximize efficiency. Maxswap allows users to add additional detectors to accommodate the organization’s evolving needs. In April, the FDA cleared Siemens’ Multix Select DR, an entry-level, floor-mounted DR system. “Traditionally, Siemens has focused on the ceiling-mounted system,” Fernandes notes. Specifically, the Multix Select DR is an affordable, space-conserving, floor-mounted DR system capable of performing a wide range of examinations. “This system fits into a smaller footprint, making it ideal for facilities that don’t have the room or can’t afford the cost of new construction for a ceiling-mounted system. It’s ideal for the small and economically minded customer,” Fernandes says. The system allows physicians to acquire high-quality images rapidly for virtually all radiographic examinations from skull to pelvis to extremities with its 14- X 17-inch mobile flat-panel detector. For pediatric exams, the system’s grid can be removed to reduce patient radiation dose. The detector can be placed in or on the patient table or in the bucky wall stand and can acquire images in portrait or landscape format. With its floating tabletop and wide, vertical coverage of the bucky wall stand, the system is easy to use. The patient table permits a flexible range of examinations (standing, sitting, recumbent, or seated in wheelchairs) and helps ensure work sequence acceleration. For example, synchronous movement of the X-ray tube assembly and the detector tray facilitates positioning. The footswitch at the bottom of the patient table helps users avoid the risk of unintended release of the system’s electromagnetic tabletop breaks. Advanced imaging software lets users choose the patient name with a single click, and the system automatically selects the appropriate organ program for the exam ordered. The system’s intelligent automation provides a high level of image quality with enhanced dose control. Carestream’s DR product family centers on its wireless detectors, according to Titus, which are designed to make the conversion to digital easier and more effective. The company also offers 35- X 43-cm and 25- X 30-cm detectors for pediatric and small-format imaging. The basis of Carestream’s product line is its DRX-1 detector technology. “About five years ago, we started with a [DRX-1] room retrofit system that allowed us to convert existing analog rooms to DR without requiring the customer to replace their existing X-ray hardware. Because the detector was cassette sized, it fit right into the existing buckys,” Titus explains. The latest members of the product family include the DRX-Evolution, DRX-Ascend, and DRX-Revolution. The DRX detector’s ability to retrofit either with an existing room or a portable system offers an easy and affordable transition to DR.
Based on the X-Factor platform, a wireless DR detector slides into existing X-ray equipment and can be used with imaging systems throughout the facility. The system is compatible with any X-ray system using ISO 4090-compliant, 35- X 43-cm cassettes. It can be installed in an exam room in one day, with no need to modify the generator or bucky, discard the wall stand or table, replace grids, or radically alter procedures. The system allows stepped-up DR productivity with minimal disruption and downtime. Compared with DR room replacements, the DRX-1 requires substantially less staff training time because of user familiarity with existing equipment. The system features configurable, modular components that combine to fit space, workflow, and budget, according to Carestream. Portable, wireless DRX detectors power the system and can be upgraded with three configurations (automated, hybrid, and standard Q), which means that it’s an organic, evolving technology that will grow as customers’ needs grow. The DRX-Ascend is a high-performance yet affordable DR system designed for imaging centers, orthopedic facilities, urgent care clinics, and hospital radiology departments. Targeted to smaller facilities, the system saves space and reduces installation costs. Also, it’s flexible, with a wireless DRX detector, floor-mounted tube stand, elevating float-top table, and vertical wall stand. The company’s flagship product is its DRX-Revolution, Titus says. “This fully digital DR mobile system was designed completely from the ground up and helped revolutionize portable imaging,” she notes. The DRX-Revolution is the industry’s only mobile X-ray system with a fully automatic collapsible column, according to the company. It eliminates the need for users to navigate tall units through hallways and around bedside monitors. The collapsible column shrinks the system to just over 4 ft. Carestream describes it as an X-ray room on wheels powered by a wireless DRX detector. Carestream also offers mobile retrofit systems. “These take existing analog systems and turns them into DR-based mobile systems,” Titus says. “If a customer still has some useful life in their mobile equipment, they can go to DR with a simple retrofit. Carestream’s DRX line also includes new bone suppression software that can remove ribs and the clavicle from an exposure to create a second image that shows just soft tissue, according to Titus, making it easier to spot lung nodules. Philips has developed wireless digital detectors called SkyPlate that are not yet available in the United States that can be used in radiography and fluoroscopy applications. “Our two-in-one systems for radiography and fluoroscopy procedures are another example of how we help hospitals to become more efficient and optimize their equipment and room utilization,” Venker says. The SkyPlates detectors are designed for use with Philips MobileDiagnost wDR release 2, DigitalDiagnost release 4, and DuraDiagnost systems and with Philips ProGrade, which are not yet available in North America, and as an upgrade solution for existing analog Philips radiography systems.